Losucon M SR is a combination of 2 oral anti-hyperglycemic drugs with complimentary mechanism of action to improve glycemic control in patients with type-2 diabetes mellitus: Glimepiride, a Sulfonylurea and Metformin, a member of the biguanide class. The primary mechanism of action of Glimepiride, is to stimulate the release of insulin from functioning pancreatic beta cells. Glimepiride acts in concert with glucose by improving the sensitivity of beta cells to physiological glucose stimulus, resulting in insulin secretion. In addition, extra pancreatic effects like reduction of basal hepatic glucose production, increased peripheral tissue sensitivity to insulin and glucose uptake may also play role in the activity of Glimepiride. Metformin decreases hepatic glucose production, decreases intestinal absorption of glucose, and improves insulin sensitivity by increasing peripheral glucose uptake and utilization. Glimepiride + Metformin combination tablet is indicated as an adjunct to diet and exercise to improve glycemic control in adults with type 2 diabetes mellitus when treatment with both Glimepiride and Metformin is appropriate or in cases where Glimepiride/Metformin mono-therapy does not result in adequate glycemic control. 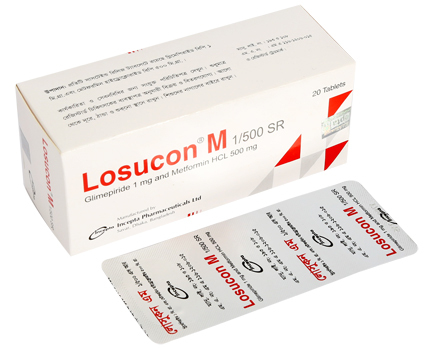 The dosage of Losucon M 1/500 SR must be the lowest which is sufficient to achieve the desired metabolic control. During treatment with Glimepiride + Metformin combination tablet, glucose levels in blood and urine must be measured regularly. The initial recommended dose of Glimepiride + Metformin combination tablet is Glimepiride 1 mg+ Metformin HCL 500 mg one tablet once daily with breakfast or first main meal of the day. Starting dose for patients inadequately controlled on Glimepiride or Metformin monotherapy is Losucon M 1/500 SR once daily, and gradually titrated after assessing the therapeutic response. Titration: The daily dose must be titrated in increments of 1 tablet. The maximum recommended dose per day is 8 mg Glimepiride and 2000 mg Metformin. When switching from combination therapy of glimepiride plus metformin to separate tablets, Glimepiride and Metformin should be administered separately on the basis of dosage currently being taken. Due to the sustained-release formulation, Losucon M 1/500 SR must be swallowed whole and not crushed or chewed. When Glimepiride + Metformin combination tablet is used in combination or with insulin, a lower dose of the Glimepiride or insulin may be required to reduce the risk of hypoglycemia. As a result of the blood glucose-lowering action of Glimepiride, hypoglycemia may occur which may also be prolonged. At the start of treatment, there may be temporary visual impairment due to the change in blood glucose levels. Occasionally, gastrointestinal symptoms e.g. nausea, vomiting, sensations of pressure or fullness in the epigastrium, abdominal pain and diarrhoea may occur. Occasionally, allergic or pseudo-allergic reactions may occur e.g. in the form of itching, urticaria or rashes. Metformin: Gastrointestinal symptoms-nausea, vomiting, diarrhoea, abdominal pain and loss of appetite are very common. Metallic taste is common. A decrease of vitamin B12 absorption with decrease of serum levels has been observed in patients treated long-term with metformin. Lactic acidosis is very rare. Metformin: Lactic acidosis is a rare but serious (high mortality in the absence of prompt treatment), complication of Metformin accumulation which can be fatal. Patients should be cautioned about prolonged fasting and excessive alcohol intake since it potentiates the effects of Metformin on lactate metabolism. It is not recommended in hepatic/renal impairment or hypoxic states. As intravascular administration of iodinated contrast materials in radiologic studies can lead to renal failure, Metformin should be discontinued temporarily. Glimepiride: In the initial weeks of treatment, the risk of hypoglycemia may be increased and careful monitoring is necessary. In exceptional stress situations (e.g. trauma, surgery, febrile infections), blood glucose regulation may deteriorate and a temporary change to insulin may be necessary to maintain good metabolic control. Pregnancy: The use of Glimepiride + Metformin combination is not recommended for use in pregnancy. Intake may cause risk/harm to child. It is recommended that such patients change over to insulin. Lactation: The use of Glimepiride + Metformin combination is not recommended for use in lactating mothers, and if the diet alone is inadequate for controlling blood glucose, insulin therapy should be considered. Pediatric use: Safety and effectiveness of Glimepiride + Metformin combination in pediatric patients have not been established. Geriatric use: Metformin is substantially excreted by the kidneys, and because aging is associated with reduced renal function, Glimepiride + Metformin combination should be used with caution in the elderly.